The worldwide trend toward marijuana legalization has triggered a wave of growth opportunities for investors. And the growth is projected to continue – in a huge way – over the next several years. In fact, according to industry analyst Arcview Research, the global legal marijuana market is expected to reach $146.4 billion by the end of 2025 – and will see a compound annual growth rate of 24.9% from 2017 to 2025. Already, a number of companies have helped investors collect double- and triple-digit returns over the past 12-18 months as Canada prepared for legalization of recreational Cannabis on October 17. But the best opportunities are still ahead for investors. As the North American market continues to mature, investors looking for maximum upside potential should consider looking beyond North America. Right now one company – ICC International Cannabis Corp (CSE: WRLD); (OTC: KNHBF) – offers significant growth potential thanks to a powerful business model. 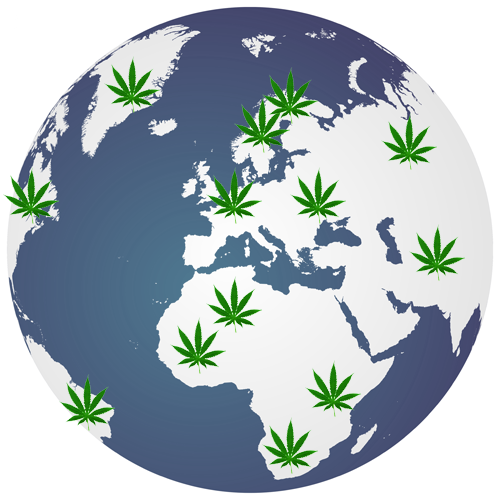 You see, ICC International Cannabis Corp (OTC:KNHBF | CSE:WRLD) has been gobbling up distribution opportunities worldwide. They recently secured rights to distribute marijuana to about 35,000 pharmacies in 16 countries through their purchase of 50% of Marathon Global Inc., which has an exclusive agreement with Cosmos Holdings Inc., a European based pharmaceutical distributor. And that is just one of the breakthrough moves they’ve made in the past few years. The company is building one of the first vertically integrated global cannabis supply chains. Because as the worldwide trend of legalizing marijuana accelerates the industry faces a new problem. There is no existing global supply chain to get cannabis from the farm to consumers around the world. It’s a big, industry-wide problem. How do you get cannabis grown in Canada into the hands of consumers in Europe? Like all problems in business, this one represents a major opportunity. And it’s the problem ICC International Cannabis Corp (OTC:KNHBF | CSE:WRLD) has already started solving. You see – marijuana isn’t corn flakes or iPhones. It isn’t even like other regulated consumer products like alcohol or cigarettes. The legal regime for cannabis is in flux around the world. Even in soon-to-be legal Canada, the rules will be wildly different from province to province. When you add the international scene to the picture, it’s even more complex. ICC International Cannabis Corp (OTC:KNHBF | CSE:WRLD) is working to solve the problem. The automated kiosk device is called the BioCanna ADM Retail System. It’s an intelligent automated retail kiosk for the dispensing of Cannabis and related products in both medical and commercial markets – direct to consumer. With strict regulations in place throughout the global Cannabis market, the BioCanna ADM could offer Cannabis retailers a means to meet and surpass requirements. The first asset in their distribution network is Marathon Global Inc. In June 2018, ICC Cannabis International closed its purchase of 50% of Marathon. It’s their beachhead for the 742 million strong European market. Through their 50% interest in Marathon, they have an exclusive agreement with Cosmos Holdings, to procure and distribute medical cannabis products and all cannabis derivatives. There are over 110 clients in the Cosmos Holdings distribution network, representing approximately 35,000 pharmacies in 16 countries across Europe. Their next major asset is Aricannabis BioTech Corp. In South America they have an LOI to purchase Cannabis Medical Group SAS. This Colombian entity holds licences to cultivate, produce, hold, sell and export cannabis and cannabis derivatives – both domestically and internationally. Cannabis Medical Group have acquired 13 hectares of optimal agricultural land located in Funza, the heart of the Bogota savanna, which is also one of the safest areas in Colombia. Under the terms of the LOI, ICC will pay US$2.0 million, and it will issue 30 million common shares to buy Cannabis Medical Group. This will give ICC International Cannabis Corp (OTC:KNHBF | CSE:WRLD) true seed to store presence. In Europe International Cannabis, through its subsidiary, Danavian, controls one of twelve Danish medical cannabis cultivation and distribution licenses. Danavian has engaged an Israeli Cannabis organic cultivation and management company, Sababa Sciences Inc. Sababa Sciences will provide end-to-end management including the implementation of advanced Israeli agricultural technologies for high-quality medical cannabis treatments. With the Fortune 500 piling into legal marijuana in droves, their timing is perfect. On August 15th, the maker of Corona and Modelo beers announced it had taken a 9.9 percent stake in the Canadian cannabis company Canopy Growth Corp (NYSE:CGC), which can be increased to 38%. The deal gives Constellation the first toehold in the cannabis-infused beverage industry the brewer said it expects to soon be legalized across the United States. They’re not alone either. The legitimacy this deal grants to “Big Cannabis” has swung open the doors to AAA brands from a multitude of industries. On August 24th, multiple sources reported to BNN Bloomberg that Diageo Plc – the world’s biggest alcohol company – was pursuing a deal with a Canadian cannabis firm. They are reportedly holding serious discussions with at least three major producers as they seek to add marijuana-infused beverages to their portfolio. But these Fortune 500 companies still need to figure out how to get their product to market. And ICC International Cannabis Corp (OTC:KNHBF | CSE:WRLD) just might have the solution. 4 Licenses…for cultivation, spanning three continents. Right now with a market cap of just US $116 million, ICC International Cannabis Corp (CSE: WRLD); (OTC: KNHBF) would appear to be significantly undervalued when compared to other companies operating in the Cannabis space. It’s a fraction of the size of the major growers. Companies like Aurora Cannabis (market cap of $8.4 billion)…Canopy Growth (market cap of $9.2 billion)…and even Auxly Cannabis Group (market cap of $444 million) have seen explosive growth over the past 12-18 months. But, investors are starting to “clue in” to marijuana’s distribution problem. And, ICC International Cannabis Corp (OTC:KNHBF | CSE:WRLD) –could be one of the biggest winners as the industry matures. As more investors become aware of the emergence of ICC International Cannabis Corp (CSE: WRLD); (OTC: KNHBF) as a true vertically integrated global Cannabis company – with dominant positions in several up-and-coming markets – the company could see significant growth in its valuation. Investors looking for high upside potential in the Cannabis space should perform their due diligence – including visiting the company’s website: https://intlcannabiscorp.com/ — and consider adding shares of ICC International Cannabis Corp (CSE: WRLD); (OTC: KNHBF) as soon as possible. WE DO NOT ADVISE ANY READER TAKE ANY SPECIFIC ACTION. LOSSES CAN BE LARGER THAN EXPECTED IF THE COMPANY EXPERIENCES ANY PROBLEMS WITH LIQUIDITY OR WIDE SPREADS. OUR WEBSITE AND NEWSLETTER ARE FOR ENTERTAINMENT PURPOSES ONLY. NEVER INVEST PURELY BASED ON OUR ALERTS. GAINS MENTIONED IN OUR NEWSLETTER AND ON OUR WEBSITE MAY BE BASED ON END-OF-DAY OR INTRADAY DATA. THIS PUBLICATION AND THEIR OWNERS AND AFFILIATES MAY HOLD POSITIONS IN THE SECURITIES MENTIONED IN OUR ALERTS, WHICH WE MAY SELL AT ANY TIME WITHOUT NOTICE TO OUR SUBSCRIBERS, WHICH MAY HAVE A NEGATIVE IMPACT ON SHARE PRICES..ARCHANGEL MEDIA’S BUSINESS MODEL IS TO RECEIVE FINANCIAL COMPENSATION TO PROMOTE PUBLIC COMPANIES. WE HAVE BEEN COMPENSATED A FEE OF NINETY FIVE THOUSAND DOLLARS FOR A ONE MONTH AWARENESS CAMPAIGN REGARDING KHNBF, BY THE COMPANY ITSELF, International Cannabis Corp. LLC. THIS COMPENSATION IS A MAJOR CONFLICT OF INTEREST IN OUR ABILITY TO BE UNBIASED REGARDING . THEREFORE, THIS COMMUNICATION SHOULD BE VIEWED AS A COMMERCIAL ADVERTISEMENT ONLY. WE HAVE NOT INVESTIGATED THE BACKGROUND OF THE HIRING THIRD PARTY OR PARTIES. ANY NON-COMPENSATED ALERTS ARE PURELY FOR THE PURPOSE OF EXPANDING OUR DATABASE FOR THE BENEFIT OF OUR FUTURE FINANCIALLY COMPENSATED INVESTOR RELATIONS EFFORTS. FREQUENTLY COMPANIES PROFILED IN OUR ALERTS MAY EXPERIENCE A LARGE INCREASE IN VOLUME AND SHARE PRICE DURING THE COURSE OF INVESTOR RELATIONS MARKETING, WHICH MAY END AS SOON AS THE INVESTOR RELATIONS MARKETING CEASES. THE INVESTOR RELATIONS MARKETING MAY BE AS BRIEF AS ONE DAY, AFTER WHICH A LARGE DECREASE IN VOLUME AND SHARE PRICE IS LIKELY TO OCCUR. OUR EMAILS MAY CONTAIN FORWARD LOOKING STATEMENTS, WHICH ARE NOT GUARANTEED TO MATERIALIZE DUE TO A VARIETY OF FACTORS.